I loved the way the two perspectives of Maile and John were shared in this book- both in first person perspective, with Maile telling the story and John's through journal entries. Sometimes letters or journals in storytelling makes me hesitant, but the author used it very successfully here, with John's emotions coming out clearly, his sense of wonder over the fascinating culture, his struggles vulnerabilities. Maile has tones of Disney's Moana with her independence, love of the ocean, and loyalty to her people. The historical story has darker themes however, with culture clash, misunderstanding, war, death, and grief. 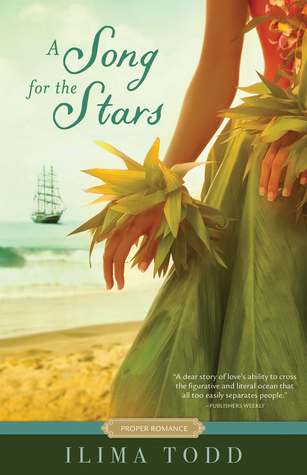 I thought the author did such a good job balancing the strong elements of the book and weaving them together- character development, interesting history and culture of the Hawaiian people, action with the battle scenes, and significant moments between Maile and John. They are both working through the devastation of loss, but Maile especially is confused and overwhelmed as she grieves her fiancé, heals and protects John, defends her father, worries over her people and the future, and experiences kindness from John. I liked seeing the lighter moments between them when they make each other laugh and some playfulness come out. John coming to know the ocean in the special way that Maile does is profound to him and deepens their connection. Their romance is so sweet and genuine and heartfelt. I appreciated the lovely storytelling that made this book stand out and it's one I highly recommend!